I love Lake Garda for the variety of sports available, the beauty of the landscape and the laid-back lifestyle. The lake is the soul of our landscape. Garda governs our local climate, from mild and temperate in autumn and winter, to fresh and breezy in summer: perfect for via ferrata, rock climbing, hiking, trekking or canyoning. Because the lake was formed by a glacier, the torrents excavated by the glacial activity have given us the perfect playground for canyoning. It’s incredible! They could almost have been formed exactly for this purpose alone. It’s normal for us to have a multi sport day: there is something for everybody, for every level and for every preference. The most important ingredient of all is to enjoy yourself. Lake Garda is surrounded by many mountains which fortunately have saved the lake from over development and excessive building. You only need to travel along the Gardesana road to appreciate this. In fact there are no large centres and the environment is amazing. The air is clear and you can live a healthy life with activities governed solely by the rhythm of the seasons. 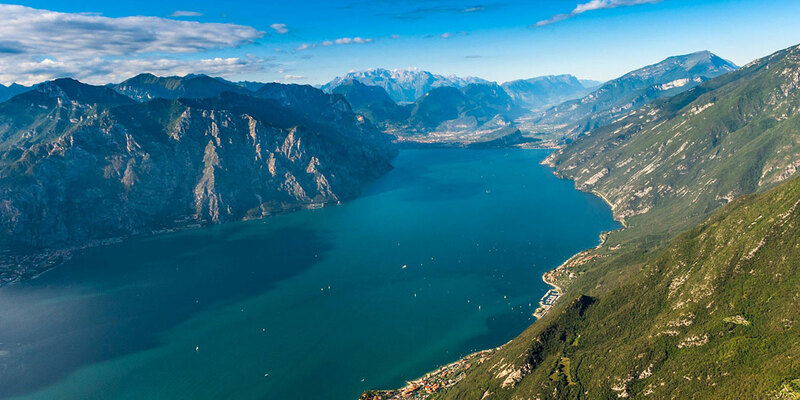 From the summit of whichever mountain you choose, you can appreciate the beauty of Lake Garda. The panoramas are unique, definitely amongst the best in the world. If you observe the light and colour of the lake and mountains from each summit they present a completely different perspective. I have climbed these mountains thousand of times, I am still taken aback and never tire by the magnificent beauty presented by this wondrous natural vista. After the weariness and adrenalin you can take a refreshing dive into the clean waters of the lake and relax on the beach. You can alternatively wander into town for an aperitivo, or recharge the batteries with a typical local dish in one of the restaurants. It doesn’t matter whether it is summer or winter, if canyoning, via ferrata, rock climbing, mountaineering or trekking. I am waiting for you here in Lake Garda to share and enjoy with you your outdoor holiday, always mindful of your complete safety.